← What does Kenny’s ABC defamation case mean? While I was reading Josh Bornstein’s excellent contribution on the subject of tax, it reminded me that progressive Australians really need to work harder at reframing this word and the whole concept of tax to make it a positive thing. The question is, how do we do this after the Right have spent so much time and effort turning tax into a dirty word? The problem with the current concept of ‘tax’ as being something bad, something annoying, something to be avoided, is that it is impossible to even mention the word in a conversation, let alone in a budget speech, without eliciting a negative reflex. So while we should be having conversations about who in our society should be paying what types of tax and how much they should be paying, we can’t even start the conversation. As an example, I am a huge fan of the mining tax, but I am deeply offended by the GP tax. There are fair ways of generating revenue and there are unfair ways. And this is what we should really be talking about, instead of reeling at the very mention of the word. So how do we fix this problem? How do we change the way our community reacts to taxation? I think we need to turn the payment of tax into a moral act. I’ve got some ideas about how we go about reframing the very act of paying tax. The first key idea that needs to be communicated is that we are very lucky to be born into a country with the infrastructure that provides us with the opportunity to live the lives that most Australians live. When I say infrastructure, I don’t only mean physical infrastructure like roads and bridges, I mean everything that makes up a civilisation. This includes a banking system that enables investment in the economy, an education system, a health system, support for arts and culture, emergency services and a defence force. A first world civilisation also has an appropriate welfare safety net to protect those who need it. And the reason we have this civilisation is because we have a democratic government, whose activities in organising this civilisation are funded by our payment of tax. Justice Oliver Wendell Holmes of the American Supreme court once said ‘I like to pay taxes. With them I buy civilization.’ He knew a thing or two that too many people have forgotten. I know I’m not telling you anything you don’t already know, but stick with me because this is going somewhere. It’s only a short step from understanding why paying tax is crucial to the existence of the Australian civilisation, to then understand why those who are benefiting most from this civilisation should, morally, be the ones paying the most tax. And this is where I pause to make clear that those on welfare are often the ones that tax payers perceive as benefiting most from civilisation, when really, they are the ones benefiting least. Why? Because our civilisation offers the greatest benefits to those who earn the most and the people earning the most wouldn’t have the opportunity to benefit from this position of wealth without the opportunity to live in our civilisation. Benefits like highly paid, interesting and intellectually fulfilling work. Benefits like a lifestyle where people can list their hobbies as buying nice things and eating nice food. Benefits like a safe, supportive community in which to raise a family. Benefits like an economy where there are enough well-off people to fund a range of business activities, where income from profits contribute to an increase in quality of life. It’s this quality of life that paying tax provides. And the better the quality of life, morally, the more an individual or a company (hello Google, Apple and Westfield just to name a few) should contribute for belonging to this civilisation. The problem with the way that we speak about tax avoidance currently is the word ‘avoidance’. You avoid bad things. To avoid something is to cleverly do something in your best interest by getting out of the way of something that’s not in your best interest. So when you put the word ‘tax’ next to the word ‘avoid’, the image conjured up is positive, clever, brave even. This is wrong and is yet another example of the way in which the Right manipulate language, and spread this common-usage phrase to suit their ideological agenda. So how about this for a new frame. What if paying tax is akin to paying rent to live in a civilisation? So just like in the property market, where the more you pay for a property, the better the location, the bigger the rooms, the better the view, the more ‘mod-cons’ available to you, the ‘status’ you receive for living there, and for companies, the more profit you make from the prime real estate you’ve secured, I think tax paying should also be viewed in the same way. The more rent (tax) you pay, the more benefit you receive from living in our civilisation, which is funded by the tax you pay. So what if we start calling those who minimise and avoid paying their fair share of tax ‘freeloaders’? What if we openly refer to them as cheapskates and slackers? What if we start a campaign to name and shame these tightwads? What if we start telling them they are squatting in our civilisation and they either need to pay their rent or we’ll evict them? What if we reinforced this frame in everything we ever say about tax? I don’t know about all of you, but I’m going to give this plan a try. Starting now. Never again will I call a tax avoider a tax avoider. 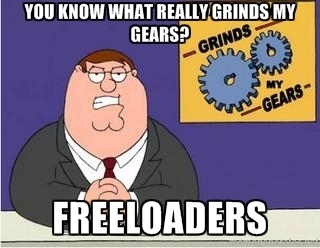 From now on, I will call them tax freeloaders. This is how we will solve the world’s problems one word at a time. Summary: most of us get more back in government services than we chip in, and it is only the top fifth of earners who are nett contributors to the tax system. They do pay the most tax. They are bankrolling the lovely safety net our civilisation has. Probably though in relation to their incomes- its a pittance- I know Kerry Packer was said to have paid I cent in the dollar tax. I would call people who avoid or minimise tax- tax cheats. They have so many allowances and loopholes denied the ordinary worker- why should some have a work car allowance and others not be able to claim a journey to work bus or train fare? Minimising tax: you mean like the myriad mums and dads who own rental properties and can negative gear? I agree Victoria, when I worked, I was proud to pay income tax because I believed it helped my fellow Australians and also made a contribution to building our nation, it is so sad that Australia has been USA ized into thinking that tax is a bad thing. Also it seems that as part of the USA thing we are (or some of us are watching, not I) USA TV shows which for 25 years has changed us from our unique character to just another State of the United States. Another good article Victoria and I like the way you have labelled those billionaires boys club tax freeloaders as I am sick and tired of some people labelling me one of the lazy bunch hand out seeker. Agree completely. I have always regarded tax freeloaders with utter contempt. They aren’t clever – just greedy and immoral. AndyM’s ‘top 10 percent’ is based on taxable income. Those earning $105,500 wouldn’t even be included in that top 10 percent if the Kerry Packers in our society didn’t use every trick in the book – and some not even included yet – to reduce their taxable incomes to a patently ridiculous low. T-Rex was a formidable creature who did not have any known predators.